Apple’s 2018 iPhone lineup features a brand new processor. This chip is manufactured on TSMC’s first generation 7nm FinFET node. The Cupertino based tech giant made some serious improvements with its 2017 A11 processor. The chip’s new performance controller allowed it to run all CPU cores simultaneously. This fact resulted in Apple beating Android in multi-core performance. It also led to severe throttling on the 2017 iPhone lineup. Now that a year has passed since the A11, Apple’s out with the A12. We’ve got the processor’s first Antutu scores. So take a look below for more details. 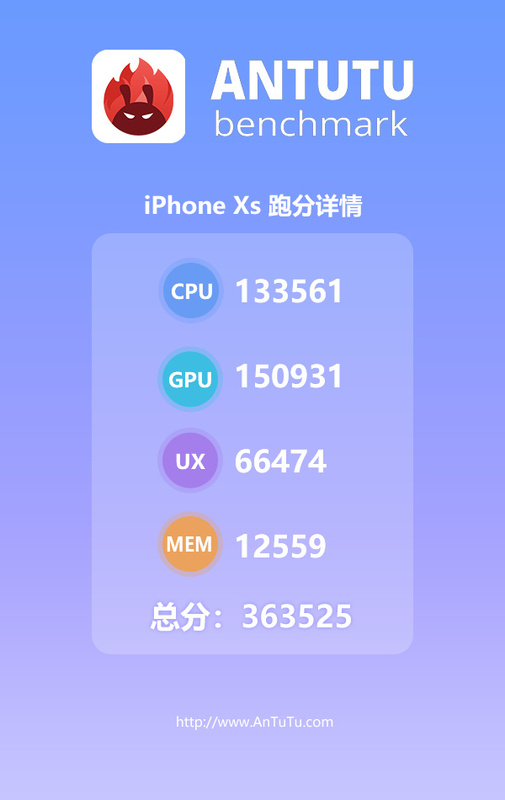 Within a week of its launch, today the iPhone XS is the subject of an Antutu score. Apple’s 2017 iPhone X performs quite well in the benchmark app. The smartphone scores between 210,000-and 230,000 points. This score range is laughable when we consider today’s results for the iPhone XS. The smartphone scores 363,525 points in Antutu and matches Apple’s claims for improvements. At its launch event last week the company claimed up to 50% performance increase for the A12’s GPU. This gain reflected in today’s Antutu run, as the Apple A12 scores 150,931 points in graphics. The score marks for a one-third increase over the A11. They also beat current 10nm processors from Android. The Samsung Galaxy S9+ with Qualcomm’s Snapdragon 845 scores around 260,000 points. Antutu is not a good indicator of daily performance as users who’ve experienced the S9+’s overheating will attest. But it is a good measure of overall performance, and Apple’s made a big jump in the department this year. Today’s score is a good start for the 2018 iPhone lineup. Apple’s smartphones for the year are iterative upgrades over the iPhone X. They unify design and bring in performance upgrades rather than new features. Once the iPhone XS and iPhone XS Max start making it into users’ hands, we’ll have a concrete idea of their performance. These details are especially important as the Google Pixel 3 lineup and the OnePlus 6T will launch next month. Both will run on the Snapdragon 845 at a time when Apple’s on 7nm processors.